Prior to his Town Hall appearance, CNN published an op-ed by Bernie Sanders where he listed nearly two dozen questions he wants the American public to think about as we transition to a new President. Unsurprisingly, these questions hit on the core of the Sanders platform. Here are the 23 questions Bernie Sanders wants you to talk about. Are we ok with the extreme income and wealth disparity between the top 1% and everyone else? Should the Walton family of Walmart own as much wealth as the bottom 40 percent of our people? Should 52% of all new income be going to the top 1 percent? Are we content with having the highest rate of childhood poverty of almost any major country on earth? Can a worker actually make ends meet on the current federal minimum wage of $7.25 an hour? Can a working-class family afford childcare that costs $15,000 or more per year? Can a disabled veteran or senior citizen really survive on only $13,000 a year from Social Security? What can be done about our political system, where millionaires and billionaires can pour millions and millions of dollars into public elections to try and elect candidates who only represent the interests of the upperclass? Should our democracy really accept that reality (of question #10)? Are we okay with state governments legislating voter suppression, which disproportionately affects minority and youth voters? Why is the United States, the richest country on the face of the earth, the only industrialized nation to not guarantee healthcare as a right to all of its citizens? Why does the United States not guarantee paid medical leave to families? Why does the United States pay the highest prices for prescription drugs, despite the fact that five major drug companies earned over $50,000,000,000 in profits last year? Can the United States compete and succeed in the global economy if it doesn’t have the most highly educated workforce? And how can we have a highly educated workforce if most young people are left with crippling debt after graduation, or unable to afford higher education? How can we ensure that any American, regardless of income or social status, has access to a high-quality education they need to be a successful contributor to our country? How do we transform our energy system towards efficient, renewable energy sources and away from the fossil fuels which are causing so much harm to the climate, while also protecting the jobs of those working in the fossil fuel industry? How do we reform our broken, inefficient criminal justice system which jails more than any other country on the face of the earth? How do we focus less on incarceration and more on education? How do we achieve common sense immigration reform while reversing the collapse of the middle class? Can we rapidly create jobs by investing in rebuilding our crumbling infrastructure? 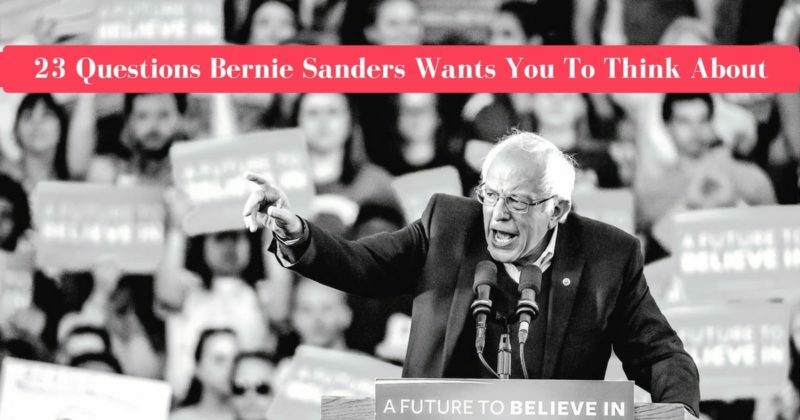 The issues listed in these 23 questions Bernie Sanders wants you discuss hit right at the core of the Sanders campaign and focuses on the future of the United States. Sanders, who is often critical of corporate media, wants to take the spotlight off of Trump tweets and focus on the issues that concern the average American. This list of questions was adapted from a Bernie Sanders op-ed published on CNN, which is linked in the first sentence of this article.